At the Forrester Center for Behavioral Health, we prioritize offering treatment for kids who are working to recover from drug addiction, as well as providing helpful information to parents. All concerned parents undoubtedly experience stress, worry, fear, and uncertainty when their kids are in drug treatment recovery, and we want you to know that our team is here to help you too. Understanding the issues associated with drug addiction better can lessen fears and ease worry. The signs of drug addiction are not always obvious. 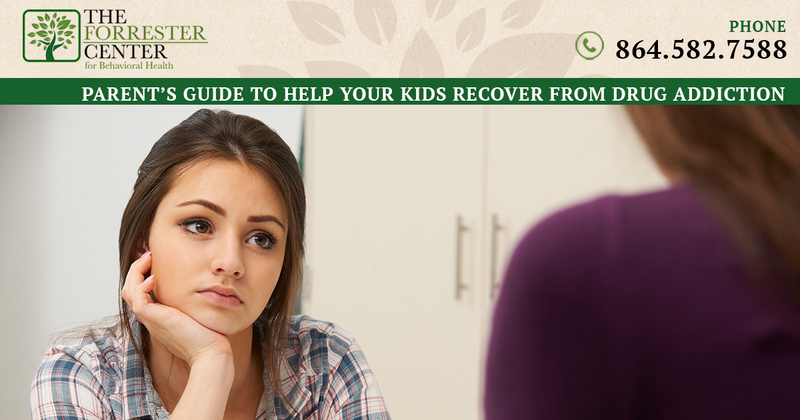 If you are a parent who did not foresee your child’s drug addiction, or if you simply do not have direct experience with addictive substances, you may not know much about the signs that indicate a problem with drugs and/or alcohol. We can help you. There are some common physical, psychological and behavioral signs of drug and alcohol abuse that can lead to addiction including a sudden change in personality or attitude, mood swings, trouble with attendance at school, impaired coordination, bloodshot eyes and sudden weight loss or gain. But even parents who know their children well and are actively involved in their lives can be surprised by the development of a drug addiction. You might have allowed yourself to believe that because you yourself do not overindulge in drug use, your child will not either. Conversely, you may see some of your own potentially addictive habits in your child. Getting involved can mean getting to know their friends, or encouraging them to invite friends over. Anything that you can do to ensure that your child is spending time with others who are a positive influence is time well spent. Addiction is difficult to overcome, so make sure that you model positive behavior for your kids – meaning, it may be wise to limit your own drinking, smoking and drug use to show them that they can do it too. Encourage your kids to talk to you about what is on their mind, whether it is their school, day, their interests, or anything that is important to them. This will encourage them to talk to you at other times as well. Making sure to hold your kids accountable will help prevent an addiction relapse. Make clear rules for your kids about drug and alcohol use and then set reasonable but firm consequences. If you have questions or need additional support for your child, email or call us at the Forrester Center at (864)582-7588. We offer a comprehensive program specifically designed for adolescents that is completely confidential, safe and effective.